Bethesda's Todd Howard says that the studio will be unveiling its new game soon, and has already begun work on its next project. While there's been plenty of activity on the Bethesda radar recently in terms of acquisitions and publishing duties, when it comes to the games that Bethesda itself is making, it's been distinctly quieter. But executive producer Todd Howard says that's all about to change however, and Bethesda's current game - believed to be a new Elder Scrolls title - is nearly ready to be announced. He said that the game was pretty fair into production, but that he didn't want to make predictions about the announcement date in case it got changed. He did say though, that once the game was announced it would the shortest time between announcement and release of any Bethesda game ever. He said it was based on the same engine as Fallout 3, but that significant modifications had been made, and that players would "almost feel like [they had] a new console" when they saw it. 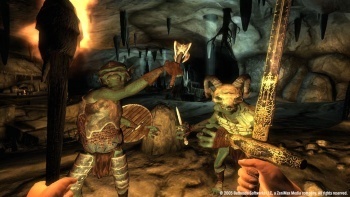 Howard added that players should expect more in terms of characters and animation, as Bethesda had spent a lot of time on both technology and talent in those areas. Howard also said that work was underway on the game that would follow Bethesda's current project, and that he spent the majority of his time working on the design for that. He added that it wasn't uncommon for projects to overlap at the studio, saying that Oblivion, Fallout 3 and the new project had all overlapped each other. But what could this new design be?